I’m looking for some comparisons from others with the same boat and motor setup. While surfing with 4 people in the boat, factory tanks full plus 500lb PNP bags, 3 clicks up on wedge and torque prop, the boat struggled to maintain surf speed of 10.8 despite being at full throttle. Motor was loud as heck and running 4100rpm. I was at 3600’ altitude. I figured this motor would have adequate power in reserve but it doesn’t seem to be the case. Anyone else experiencing similar results or is mine an anomaly? Can you specify exactly what prop you are using? For 10yrs on here everyone was convinced the 1235 was the ultimate torque prop. call a leading prop vendor and they’ll define torque prop by whatever it is they want sold that day. Same boat but slightly different motor here since I have the 410, but I was at 4900' 2 weeks ago with a 2249 prop and was running pretty much the same setup except only 75% in the non-surfside rear. I think I only had to go full throttle one time but the boat was loaded with 10 or so people that round. I found that if I launched in Lift, then put in 2 clicks of wedge when at surf speed, I could run the rest of the time at 10.2-10.4 without going over ~3900 rpms. If I launched with 2 clicks of wedge down, then that run was ~4100-4200 rpms the whole time to get the same speed since the bow starts out higher and stays there. This was with 4-5 people in the boat, and I was generally running slower than your 10.8 since most of my riders were first timers or relative newbies to wakesurfing. call a reputable prop vendor or ACME direct.. tell them your set up (ballast weight), boat, engine, what sport you do most often behind it and go from there... I went from 1235 to 2249 from recomendations on forums, then a call to Nettles Prop and now running the 2777 which has been the best thus far. All this 1235 prop talk doesn't apply to the '16 and newer 23LSV's. Different ball game with the motor and drive ratio change. In my '16 23LSV I had the 2249 prop and that motor was screaming while surfing at 10.6, 410 motor and ~700' elevation. 4500+ RPM. If you didn't get it up to speed right you ran out of throttle. In my '17 23LSV and my '18 23LSV I have the 410 motors but the 2277 prop. Now Im running 3500-3600 RPM's and have plenty of throttle left. Your elevation may be the difference here. For years with the older 23LSV ('15 and earlier) everyone said go to the Torque (1235) prop. That was a great prop for that boat. IMO, when the '16 and later 23LSV's came out the thought was the boats would need a torque prop because that's what worked before. The 2249 Torque prop isn't the correct prop unless you need it for elevation. Too many RPM's and a lower top speed. Call Acme and ask them what they recommend for your elevation. Cycle your wedge full up stowed to full down lift, a couple of time while you are at idle cruise speed. This will reset your wedge calibration. Just Incase you thought it was at three clicks and your wedge could of been more, and thus lugging your boat. Call Acme and talk to Jim. He knows his stuff. This doesn't really answer the OP's question, but why does Malibu market their lower pitched prop as a "torque prop"? Seems like the wrong term, kind of like "TurboTax". So if you are truly hitting a speed wall, where you are out of throttle and the boat won't go faster, you may be able to gear down for more rpms and push through. But that doesn't sound like a remedy you are after. In that case, you need to make the boat more efficient through the water. How? 1. Try less wedge. start with 1 click and see where RPMs land. The Wedge is a neat tool, but it's also the equivalent of dragging around a parachute, and more wedge will definitely translate to more RPMs. 2. Try dumping some weight / move weight around. I know people say you don't need bow weight in the new hull, but I don't know whether those people are at altitude. When you get to the bleeding edge, small changes can make the difference. so I'd see as a test if moving a couple of your crew to the bow helps out. If so, then you either need weight up there (people/water/lead) or you need to dump weight from the rear to keep the balance proportional. With my 14 I found I couldn't run more that 2 clicks of wedge at 4000'. So I learned to love the wave at 1 click. To clarify on Shawn’s bow weight point, I would have a kid or two up front most of the time in my example above and it definitely helps. When running with 4-5 adults only, I didn’t have any extra bow weight beyond full stock or anyone in the bow. I think I dumped the rears to both be at 75% then and had generally similar rpm/speed results. As to loving the wave while giving up a little on wedge or speed at altitude, it’s still pretty dang good. Here’s a pic from the trip, running at 10.0-10.2 since this was a new rider and her first outing to toss the rope. RPMs were 3900 with 2 clicks of wedge and she had no problem playing back in the 20’ range for several minutes. I’m in the camp of folks who think prop is NOT your issue. And yes, @shawndoggy, I am opposed to the wall. Anyway, folks often underestimate the importance of front -to- back weight distribution on these boats. You’re running stern heavy at altitude when you should be over compensating in the other direction. Start by telling people where to sit. Don’t make your problem worse by letting all those adults pile into the back or sit on your wakeview bench. Move them up to the bow and observers seat. As others have said you could back off the wedge; I’m not a fan of tons of wedge anyway. Long > Tall when it comes to surf waves. Contrary to initial reports, the new 23 benefits from bow weight. I almost NEVER surf without an adult or two in the bow. Finally, and this hasn’t been mentioned... experiment how fast or slow you roll into the throttle. It’s a software thing, but the right timing matters when it comes to avoiding the “speed wall.” The best way I can describe it is... you only have so much travel before that stick hits the bottom; be efficient with your use of that limited throttle. I tend to start slow (gentle pull) then once the rider is up and the boat has gotten out of its own way I lay into it a little more; this middle section of the throttle is pretty efficient meaning you’ll make good mph gains towards your 11 mph goal with that section of the throttle. Then ease off as the yellow line gets to the white space on the throttle line and you hear the beep. Newbies often just roll into the throttle hard using it all up before the engine can build speed properly. When I drive (same boat) I always have lots of throttle left. Also, don’t try to start when you’re also trying to straighten out (ie turning the wheel while the boat is trying to make progress towards your 11mph goal). That’s super inefficient and often results in using too much throttle. I am at 3000’ to 5000’ and have the ls3 450 but in a ‘15 LSV. I run 4300lbs and wedge at 3 to 4 from ramp @11mph. At 3000’ the 1235 was ok. 5000’ was no go. I run a 2249 now and it is a perfect fit for our alt. I do agree with everything said about weight. I have to run 1000lbs in the nose to counter the 2000lbs in the lockers. That’s on top of stock. I have a 2018 LSV with 450 and 2249 prop. I just spent the weekend at bass lake (3415 ft elevation). Pretty much the same set up as you are working with. I surfed all weekend with 4-5 in the boat, full stock ballast, and 650s in the rear. I set the speed to 10.8 and wedge 2 clicks from ramp. I had throttle for days and never felt like I was anywhere near hitting a wall. Id try a little less wedge. As @IXFE reccomended, you may want to shuffle some folks around and put some people in th bow, they may help. 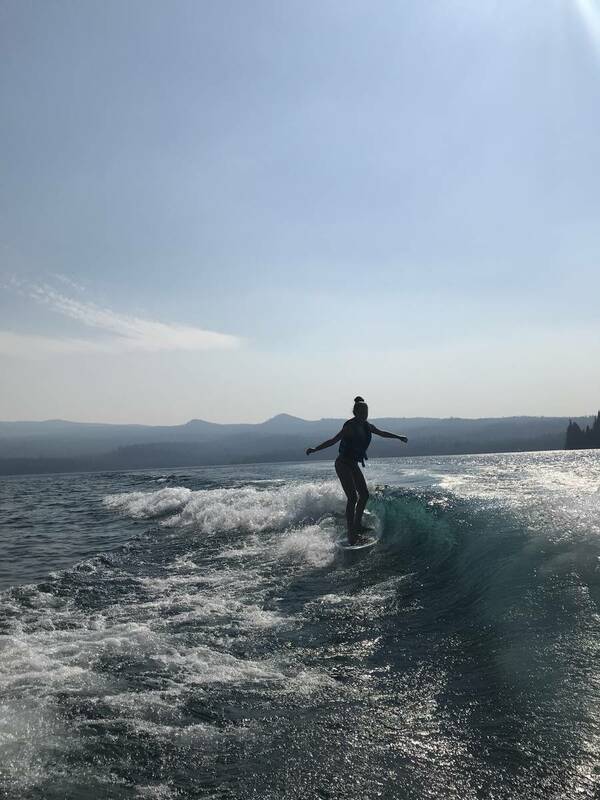 Although I will say I rarely have people in the bow of my boat while surfing, but when I do, it’s does help a bit, and makes the wave bigger and longer. ill be in Tahoe for a week starting Saturday, and really curious to see how the 450 does at they elevation. I’m curious to hear about your results at Tahoe. Your setup at Bass Lake sounds similar to mine. Was your motor not screaming? Mine is running so loud that I feel like it should’ve come with a set of earplugs. If you’re struggling to get to speed playing bow weight games is a weak temporary fix to make it through a couple weekends. Add 2 more adults and an extra cooler on a busy weekend and you’re back to being stuck. bottom line, go to max diameter 15-16” within NLT 3/4” clearance between prop and hull.... and drop 2-3” of pitch from what you have now that’s struggling. And you can probrably add another 500-1000lbs and not have to play the weight redistribution games. Power through. IMHO, you have to have weight it the bow in order to allow more weight in rear or midship. In my 257, I have the H6 450hp and a 16x15 prop, run 7200lbs ballast with the bow sack full. It also includes 1000 lead placed under the rear seats No probs. Also a boat with the bow up makes the prop want to push the boat up instead of forward. I did make a suckgate twice the size of the ones you normally see to see how it affected the wave. It worked, but also bumped the rpms up. I saw your picture of your dash screen on Facebook. Here's a trick you might try. On your dash, if the gap on the line for your speed control goes all the way over to the right and you get a beep indicating the speed control has taken over, you can very slowly pull back on the throttle to drag the gap back to the left. This may give you a bit more throttle. The longer you take to get up to speed, sometimes the more the gap moves to the right. Try getting up to speed a little faster. Good stuff @shawndoggy! Thanks for sharing this. I’ll be getting into town around 3 on Saturday, so I’ll make the call to drop it in then. I’ll be keeping my eyes on these forecasts. I couldn’t disagree more. Getting the front/rear weight distribution squared away isn’t a game, bud. It’s just proper boating. More prop is not always the answer. The OP is already running a super aggressive prop on a gear reduction transmission. With this combo his rpm’s are north of 4K. And you’re telling to keep digging deeper?